Man with throat cancer healed in Manchester NH, now arm healed! Check out Roberts Cancer Healing Testimony from Manchester NH! Last year Robert had throat cancer when our brother and sister in Christ, Suzanne and Greg came out with us to get kickstarted in healing. Robert was the first person Greg prayed for that day. Robert’s pain completely disappeared after a couple quick prayers. He went in for the scheduled surgery two days later and the doctors couldn’t explain how the tumor had almost completely disappeared. Without further treatment the cancer was completely gone. Today he got healed from an arm injury and his daughter and his son-in-law also got healed over the course about 5 minutes. Jesus is looking for His church to step out in faith and crush sickness. Let’s go church, ….the harvest in plentiful!! Jay Gets Healed, Delivered from Addictions, and Finds Jesus! Repeated acts of compassion, love, and discipleship along with the power in the name of Jesus, can transform lives! I remember the dramatic day neuropathy in his feet got healed, but that was just the beginning of walking with God. He got a wake up call from Holy Spirit that day and look what God did with Him since! Yay God!!! Blessed are the poor in Manchester NH! 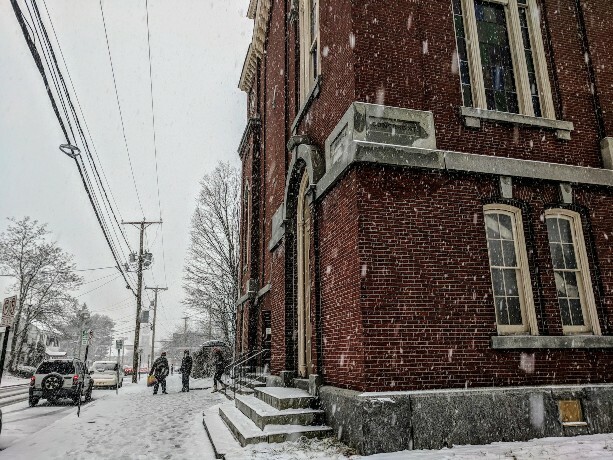 MANCHESTER, NH – Four years ago Henry Demers thought it would be a good idea to organize a Thanksgiving outreach for the city’s homeless. But God had a better idea, says Demers, and redirected him toward something much bigger, resulting in one of the city’s largest annual charitable day’s of giving. 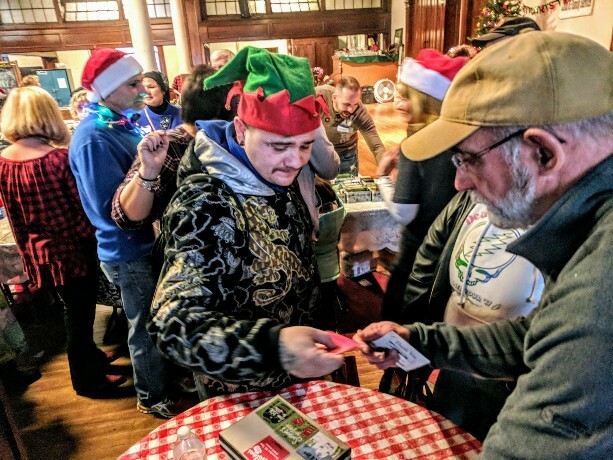 This year’s event – renamed Funky Christmas Wishes in honor of longtime advocate for the homeless Joe Funk, who passed away in July – was the fourth such event. It provided essentials, food and gifts to 300 people in need, just for showing up Dec. 9 at 1st Baptist Church on Union Street. Attendees also got a free lunch, a $5 gift card of their choosing to Dunkins or Subway, and the offer of intercessory prayer. 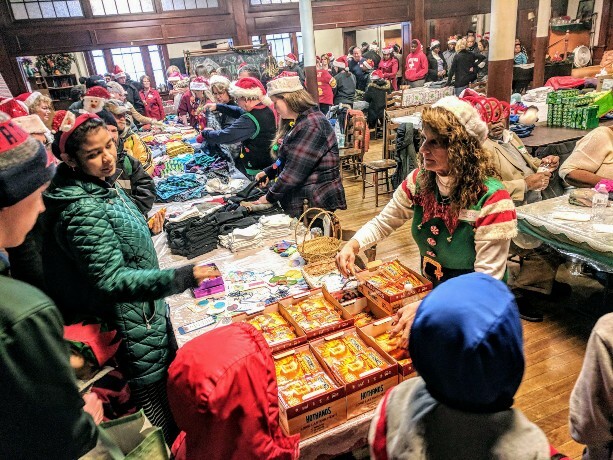 All items – from brand new sweatshirts, blankets, socks and underwear, to hand-knit winter accessories, toys for kids and festive holiday hats for everyone – were donated by more than 70 local church communities and organizations. 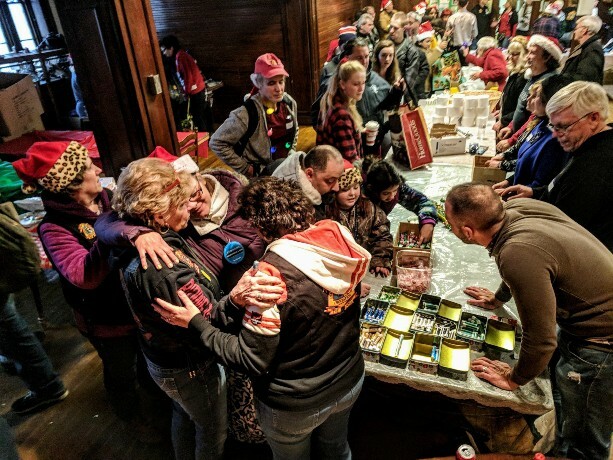 Once inside the church, each person was given a ticket and was partnered with a volunteer “personal shopper” who stayed with them as they made their way around the tables inside the sanctuary, where they could choose one of each item they wanted or needed and stuff it into a bag. But first, attendees were invited upstairs for a church service until their number was called, for a time of prayer and singing. Demers, founder and president of Harmony Home and lead organizer for the event, has a heart for the city’s homeless. His non-profit ministry is a place where the homeless can stop by during the day to have a meal, take a shower, wash their laundry, or pick up some clean used clothing and seek help from Demers and his staff with whatever they’re struggling with – including addiction. “I used to work at the city’s Mental Health Center,” says Demers, who acknowledges that the services provided through Harmony Home are similar to those the city’s Homeless Service Center on Central Street used to offer. It was closed for good in 2015 due to lack of funding. Demers says almost every day in the 18-months he’s been in operation, someone comes to Harmony Home seeking a way to end their addiction. He’s been able to help anyone with a valid ID and a Social Security number to get treatment, usually through a California-based recovery center. It’s no mistake that Harmony Home, a residence located on the grounds of Hope Tabernacle Church on Cedar Street, is just around the corner from the old day center. Scott Levesque, left, and Scott Spiewak, right, made themselves available at the exit for anyone in need of prayer. Demers’ own story is inspiring. He was orphaned as a teenager, losing both his parents to cancer within a year of one another by the time he was 18. He was the youngest of five kids, so he still had family support and his parents left them financially secure, but he gives God all the credit for guiding his path. “I was a partying teenager, but after losing both my parents so young, it sobered me up and changed me spiritually. I wanted to be able to look back one day at a life I could be proud of, and that’s been my mission ever since,” Demers says. 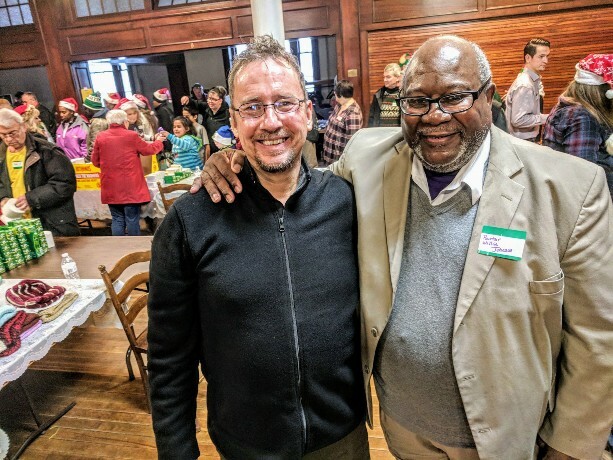 Willie Johnson, pastor of the New Beginnings Church of God in Christ on Elm Street, has been involved with faith-based Christmas outreaches around the city for 16 years. He says it’s simply what he’s called to do as a Christian. While it doesn’t necessarily absolve a city from having resources in place, Johnson says outreach to the needy should be on everyone’s agenda. “You have to want this. You have to want to be nice and good. That’s for each of us personally to decide. Christ died on the cross for our sins so that we can be a blessing to one another,” Johnson says. Near the exit Scott Levesque, of Imperishable Love Ministries, and Scott Spiewak who belongs to House of Prayer in Concord, gently asked people if they could pray with them before they left. and laid hands on people. “I think this is a beautiful thing. I’d love to see it happen routinely in the city, not just at Christmastime,” Spiewak says. 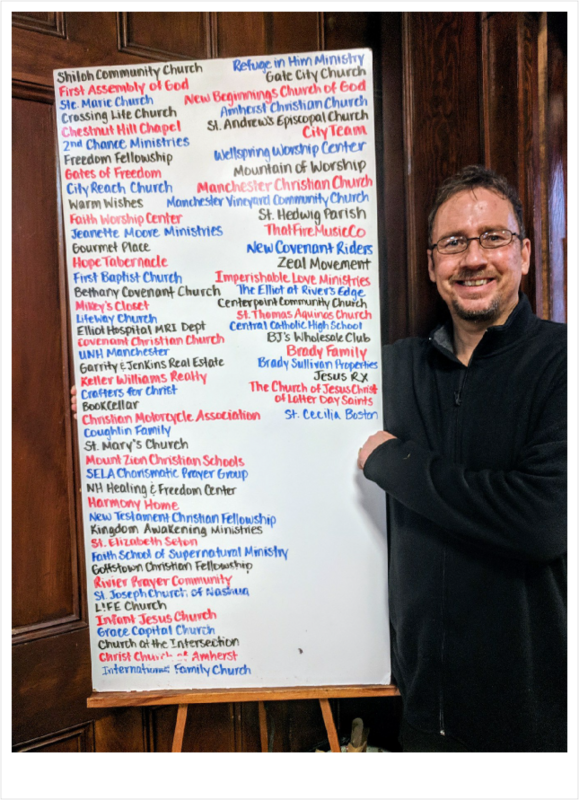 “Not only is this a blessing for the community, but for the body of Christ to come together and work in unity, that’s a beautiful thing to see. People are laying down their lives for the Lord,” Levesque says. Phil Haney of Merrimack volunteered his time as a personal shopper, and accompanied four people through the line. We hit the streets every week, ministering to the homeless, praying for the sick, and blessing the poor and we see people touched by Jesus and healed every week. Not only are they healed, but seeds of hope are planted, and watered, as God gives increase as His goodness leads them to repentance. MANY hearts are turned back to the Father as they begin to see hope that they will indeed find their way out of the bonds of addiction and poverty. Check out this interview with me, our friend Garth, and Brandt Gillespie formerly with the Christian Broadcast Network and now head of Media Productions at Lion of Judah church. See how it all started and where the Lord has lead our efforts these past three years! May you be encouraged to step out in faith, be the light of the world, and see miracles, signs, and wonders in your everyday life! Miracles in the Boston Homeless Community! Check out this Boston based newscast/interview that our friend Brandt Gillespie filmed, who is Audio/Video Director at Congregación León de Judá in Boston MA. 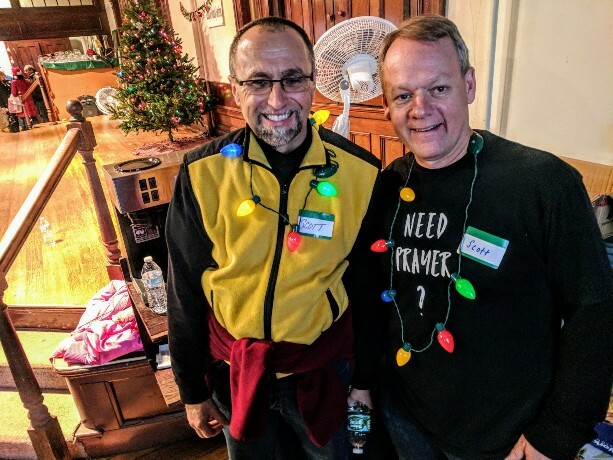 He is a media mogul with a YouTube channel called PRAYtv, doing wonderful exploits for the Kingdom of heaven and wanted to capture exactly what we were doing each week when we minister to the homeless in Boston and see miracles every week. May this broadcast inspire many to step out in faith and watch Holy Spirit reveal the nature of Jesus, and God’s Love!